If you're a sucker for all things healthy and orange, you're probably already doing your body a huge favour. If you're not, it's time to start eating more of these golden-toned veggies and fruits. Carrots, butternut squash and sweet potatoes are rich in beta carotene, a pigment that gives orange food its orange colouring. 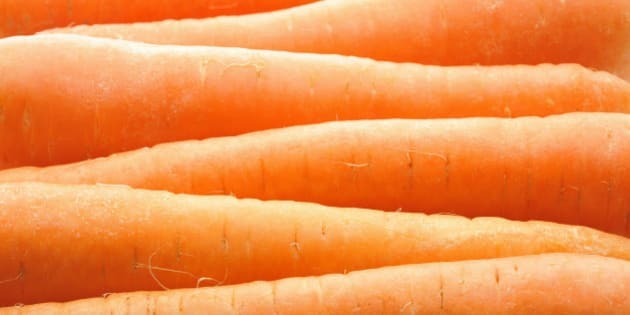 Beta carotene is converted to vitamin A when it enters the bloodstream, and helps protect the body against cancer and cardiovascular disease, boost the immune system and protect the eyes. "To ensure absorption of vitamin A, eat your orange vegetables with a small amount of healthy unrefined fat like organic butter or unrefined olive or coconut oil," says Tricia Sedgwick, a registered holistic nutritionist of The World In A Garden based in Vancouver. Of course, not all orange is healthy — one of the unhealthiest processed foods just happens to be orange as well. "Orange processed cheese with additives, artificial dyes and flavours is one to avoid. A cow's milk is white and the cheese that we make of it should be too," Sedgwick says. Drinking too much orange and carrot juice can also spike blood sugar levels, she adds. Juicing fruits and vegetables often remove fibres that are used to slow down the absorption of sugars in your bloodstream. And eating too much orange can also make you, well, orange. Carotenemia, a clinical condition, causes a yellow pigmentation in the skin from increased beta-carotene levels in the blood — you usually see this happen with children. If you're new to orange, there are some easy ways to sneak it into the routine you already have. Try adding cooked up squash to your salad, eating carrots with chips and dip or replacing white potatoes with sweet ones. Carrots truly are one of nature's original superfoods. They are packed with vitamin A, prevent cancer, help our vision, helps slow down the aging of cells and help clear our skin. Could you ask for more? Sometimes called the "fruit of angels," papaya promotes healthy digestive health, protects our bodies against disease and is also an immune booster. Besides all this, it also tastes great. There's still time to eat fall's favourite vegetable. Pumpkins keep our eyesight sharp, aids weight loss and the seeds can also help protect your body against heart disease. Pumpkins are also extremely versatile: check out 20 things you can do with a pumpkin. Some studies have found that orange or tangerine tomatoes contain lycopene that is more easily absorbed into the body than red tomatoes. Lycopene is a powerful antioxidant that protects our bodies from cancer and heart disease. Low in fat, this buttery tasting harvest vegetable is full of fibre, potassium and helps build stronger bones. And the more orange the squash, the healthier it is! Orange potatoes keep acne away? It's true. Sweet potatoes are packed with vitamin A — an anti-inflammatory vitamin that helps fight acne-causing bacteria. And sure, sweet potato fries are healthier than their white potato counterparts, but you may want to stick with roasting them if you're looking to cut back on fat. Not including the cantaloupe health scare back in 2011, this melon is pretty healthy. Cantaloupes are sweet and full of vitamin A, vitamin C and beta carotene. This tiny but mighty fruit is packed with iron, fibre and potassium. But if you're eating them dried, just make sure you watch out for the sugar content. Golden beets, like their red cousins, are low in calories (about 42 per root), full of fibre and potassium, and prevent constipation. Fellas in particular, you may also want to consider adding guava to your diet. This tropical fruit is packed with antioxidant lycopene that fights against prostate cancer. Fun fact: it also has 63 per cent more potassium than a banana.